Thread: YIKE!!!!! The black uniforms return! Oh well, the navy uniforms return. One can't imagine those awful uniforms returning, just when we have got used to seeing the Indian team in the sky blue outfits with the yellow/black patches. Come to think of it, they played their worst ODI cricket in those uniforms! Did they have to do this? I definitely encourage some variety in the uniforms, but this is going too far. Last edited by Arjun; 23-12-2005 at 06:20 AM. I remember the pathetic world cup 1992 for India and that disastrous 5-2 loss in South Africa. 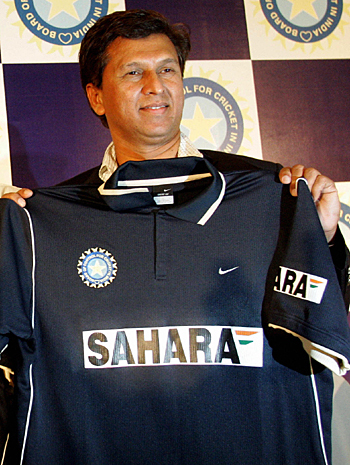 There's one more picture of Niranjan Shah, Lalit Modi and Kiran More posing with these awful T-shirts. And now we have NIKE ticks on them! Also add that disastrous four-team tournament in New Zealand in 1994, and an average ODI series a year before. Those uniforms may be nothing but bad luck. Hopefully they'll change kits as frequently as PAK or SL. Thanks for the picture. That uniform looks bad. I really liked the earlier on. Also a uniform India wore in 1997 in the tri series in South Africa also featuring Zimbabwe was one I really liked. That may well be my favourite Indian uniform. So India is no longer 'men in blue'. I honestly hated the current Indian Shirt. I love the 'Sky Blue' colour, but I HATED, HATED this current shirt. This new one looks 'modern' at least and personally I like the colour, and I'm not one for superstition. After all, the Indian team has been a beacon of ODI mediocrity under the sky blue as well. The new shirt looks far more 'sleek', 'modern' and more 'professional', something like the Black Caps shirt or the English shirt. It's time to evolve, I say....well done. This came on the CricInfo India front page. There's one more, and both were taken by Getty. I saw that image only recently. I couldn't find the picture you mentioned in today's TOI (or Indiatimes.com? ), but that's an interesting observation. Anyway, you can also count out watching one TV channel, whose programming, as many say, is awful. Bring back the sky blue (or electric, whatever), that new one looks rubbish. Actually I don't mind it as much as the sky blue kit, but won't the players be cooked alive in it in India? Yeah me too mate, I actually don't mind it at all, it's a nice change. But yeah, I can't imagine how hot they'd feel if they're playing in India. I think it'll be the electric blue kit for India, and perhaps the navy blue one when they go to some place cooler, (although the kits would clash a little if they went to NZ). Depends on the material. For example, the kiwis use a material that keeps them cool in the heat and warm in the cold, despite the colour. It looks like a soccer shirt. I checked now. It was actually in yesterdays Mumbai Mirror supplement, page 27. Didnt seem any different to the current one. But who can predict the thought processes of the guys running our cricket ? Should make them out of cotton instead of polyester.